I pray all is well with you! Can you believe it…?! Thanksgiving has already passed and we are in full fledged Christmas season. I am feeling so joyful these days. I made the decision that I was going to rejoice my way into 2019. I’m not going to let anything get me down. Not even the early winter weather we’ve been experiencing here in Wisconsin! I’ve already pulled out my heavy sweaters and very soon i’ll be wrapping a scarf around my neck. 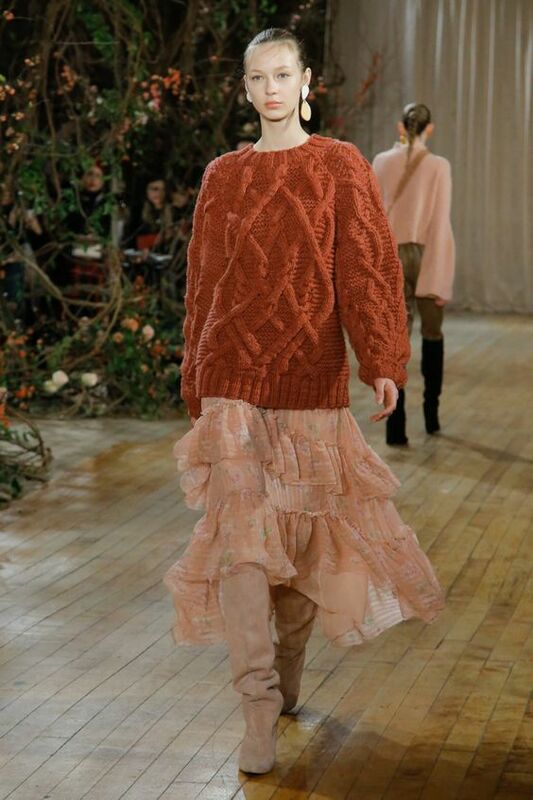 Good thing for me chunky sweaters are all over the runway this season. As I was scrolling through pinterest I was very intrigued by how designers are pairing oversized chunky sweaters with lighter weight soft skirts. Below are a few examples. The look on the left is from Pabal Gurung and the look on the right is from Ulla Johnson. It made me want to go through my closet and see if I had anything that I could pull from my existing wardrobe to play to with this look. To my surprise I was able to achieve a similar look with a rayon crepe cheetah print bias cut skirt that I recently bought from the thrift store and my favorite cream colored chunky knit H&M sweater that I had purchased from the Goodwill a few years ago. In order to keep me from looking overly frumpy I loosely tucked the sweater in at the front and back. Paired it with my new black suede stilleto boots from Forever 21 to give me height and provide a sleek silohuette. Paired it with some yellow tassle earrings and voile! My version of the designer look! Well that’s all for now! Until next time.